Snoop Dogg has started his own eSports league. The D. O. double G has started his very own eSports tournament called Gangsta Gaming League, and in case you were wondering, yes, you are allowed to smoke cannabis while playing. 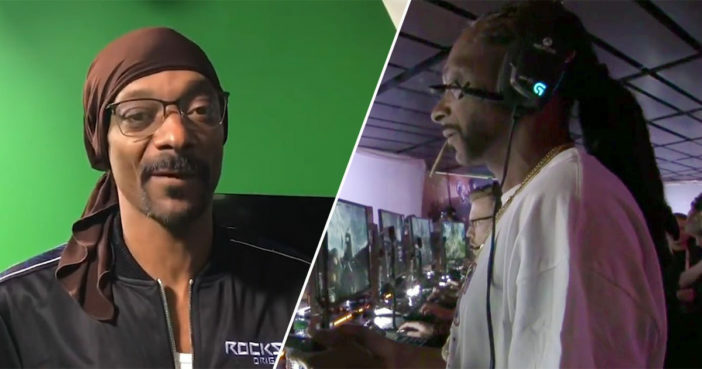 Not content with being a notorious hip-hop legend, Snoop has long had a vested and open interest in the world of gaming. If you dig through your memory banks deep enough you might just remember him taking part in a Battlefield 1 tournament with EA. Clearly not content with being a pawn in other people’s games, he’s now taken matters into his own hands. Taking place last night (March 14) and in collaboration with Merry Jane, the Gangsta Gaming League streamed a Madden 19 tournament with some of Snoop’s nearest and dearest gaming chums. People like Red Woods, Red Grant, Shelton and Young Sagg, all battled it out in a race to become the ‘Top Dogg’. You can watch the league play out below if you’ve got a spare six hours. The $11,000 prize pool was eventually won by Shelton who beat Red Grant and Lala en route to the final. Winning the pool allowed Shelton the chance to face off against the Boss Dogg himself for a chance to be crowned Biggest Dogg? Insurmountable Dogg? Cataclysimic Dog? At any rate, Snoop won 10 to 14 so he remains top of the pile with a 100% win record of 1 –0 in the league. Gotta respect a guy who starts his own gaming league and makes himself the boss. He’s like the Shao Khan of modern eSports. Genius.